From the creepy to the fantastically valuable, all sorts of strange things have been unearthed in storage units. As we can see from shows like Storage Wars, old storage units can be an absolute goldmine. In some of these cases, they were, well in others, maybe less of a goldmine than a horror movie! Unfortunately, this one’s true. After falling on hard times, and perhaps dealing with some personal issues, a woman in Florida failed to bury her mother’s body and instead stored the remains in a storage unit. There are other stories of people keeping cremated remains of family members in storage units, but those can’t really compare to an actual body! This is a much better discovery than a dead body! A lucky auction winner found an old NASA rocket and countdown clock in an old storage unit. Apparently the equipment was part of a discontinued space program. A famous story. Burt Reynolds notoriously used to hang on to mementos from film and TV shows, as well as personal belongings. Some of the items found in Burt Reynolds’ storage unit included: Roy Rogers’ saddle, Reynolds’ personal letters, the canoe from the movie Deliverance. There were so many items of note that a group of people came together to purchase the locker and form the Burt Reynolds and Friends Museum. So there’s a happy ending for the many memories of this film legend! In a truly strange story, a man from North Carolina found an old meat smoker in a storage unit purchased at an auction. Upon looking inside, he got a nasty surprise–a human leg. As it turns out, the original owner of the leg was keeping it so he could eventually be buried with it. The two men clashed when the one who now legally owned the leg began charging people to look inside the meat smoker and see it. Not wanting to lose profits, he refused to surrender the leg to its original owner. After a battle in court, the leg was returned to its rightful owner, who will get to be buried intact after all. A man found the first ever Action Comic starring Superman in a storage locker he bought in the San Fernando Valley. Valued at a million dollars, just finding the comic would have been an impressive enough story except for the twist at the end. Turns out, the comic originally belonged to the actor Nicolas Cage and had been stolen from his home eleven years before resurfacing. Naturally, Cage was pretty thrilled to be reunited with his comic book. 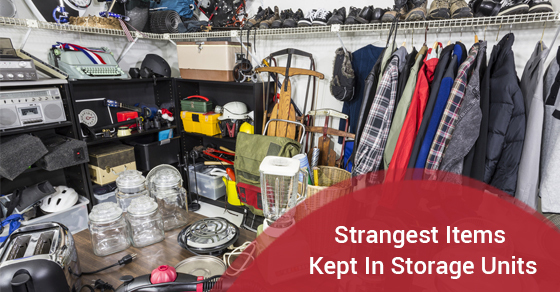 Storage units are not only an easy and convenient way to keep your home and your life more organized and less cluttered, these facilities also have surprising histories and interesting trivia.